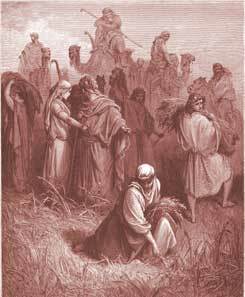 Ruth gleans in the field of Boaz. (1-3) The kindness of Boaz to Ruth. (4-16) Ruth returns to her mother-in-law. (17-23)1-3 Observe Ruth's humility. When Providence had made her poor, she cheerfully stoops to her lot. High spirits will rather starve than stoop; not so Ruth. Nay, it is her own proposal. She speaks humbly in her expectation of leave to glean. We may not demand kindness as a debt, but ask, and take it as a favour, though in a small matter. Ruth also was an example of industry. She loved not to eat the bread of idleness. This is an example to young people. Diligence promises well, both for this world and the other. We must not be shy of any honest employment. No labour is a reproach. Sin is a thing below us, but we must not think any thing else so, to which Providence call us. She was an example of regard to her mother, and of trust in Providence. God wisely orders what seem to us small events; and those that appear altogether uncertain, still are directed to serve his own glory, and the good of his people. 4-16 The pious and kind language between Boaz and his reapers shows that there were godly persons in Israel. Such language as this is seldom heard in our field; too often, on the contrary, what is immoral and corrupt. A stranger would form a very different opinion of our land, from that which Ruth would form of Israel from the converse and conduct of Boaz and his reapers. But true religion will teach a man to behave aright in all states and conditions; it will form kind masters and faithful servants, and cause harmony in families. True religion will cause mutual love and kindness among persons of different ranks. It had these effects on Boaz and his men. When he came to them he prayed for them. They did not, as soon as he was out of hearing curse him, as some ill-natured servants that hate their master's eye, but they returned his courtesy. Things are likely to go on well where there is such good-will as this between masters and servants. They expressed their kindness to each other by praying one for another. Boaz inquired concerning the stranger he saw, and ordered her to be well treated. Masters must take care, not only that they do no hurt themselves, but that they suffer not their servants and those under them to do wrong. Ruth humbly owned herself unworthy of favours, seeing she was born and brought up a heathen. It well becomes us all to think humbly of ourselves, esteeming others better than ourselves. And let us, in the kindness of Boaz to Ruth, note the kindness of the Lord Jesus Christ to poor sinners. 17-23 It encourages industry, that in all labour, even that of gleaning, there is profit. Ruth was pleased with what she gained by her own industry, and was careful to secure it. Let us thus take care that we lose not those things which we have wrought, which we have gained for our souls' good, #2Jo 1:8|. Parents should examine their children, as Naomi did, not to frighten or discourage them, so as to make them hate home, or tempt them to tell a lie; but to commend them if they have done well, and with mildness to reprove and caution them if they have done otherwise. It is a good question for us to ask ourselves every night, Where have I gleaned to-day? What improvement have I made in knowledge and grace? What have I done that will turn to a good account? When the Lord deals bountifully with us, let us not be found in any other field, nor seeking for happiness and satisfaction in the creature. We lose Divine favours, if we slight them. Ruth dutifully observed her mother's directions. And when the harvest was ended, she kept her aged mother company at home. Dinah went out to see the daughters of the land; her vanity ended in disgrace, #Ge 34|. Ruth kept at home, and helped to maintain her mother, and went out on no other errand than to get provision for her; her humility and industry ended in preferment. Ruth showed the quality of humility that we can imitate here. She did not just presume to glean even though she had the right to. She asked in a kind way and she received a kind response. CORN, cont. ; From Bible Study Tools - corn is a general term applied in the Bible to all edible seeds, grain. In the middle east In Jesus day and before, they did not know of the 'corn' of the W, hemisphere as we know it. Biblical 'corn' was not just - wheat. From David W. Daniels (Bible Versions); "The KJV translators made no mistake 102 times in their proper translation 'corn'. It is the New World citizens who have mistakenly applied our word 'maiz' to the biblical 'corn'. I often wonder if some of the places in the Bible exist still,and called the same name or if it has been changed do people teach their children these things? and tell them stories about Father GOD and of all the wonderful and amazing things that has happened or do they read them in a book like we do?,wouldn't it be fascinating to see these places with your own eyes,I think it would be AWESOME!!!!. "Corn" was not corn as we know it today. "Corns of Wheat" was ... you guessed it... wheat. and "ears" were the "heads" of the stalk of wheat, with all of the individual kernels of wheat. The same terms are used with barely. Its the birthplace of my family. I find it inspiring. What Do You Think of Ruth 2? Which relative-in-law allowed Ruth to harvest his fields for an entire season?